I’m playing the card game Netrunner against a stranger, a friend-of-a-friend. I don’t know his strategies and I don’t know his cards. It’s clear, though, his knowledge of the intricacies of this game is a league ahead of my own. On the pub bench between us, slightly squished between our pints, are scattered playing cards. They represent, on my side, the central and remote servers of an evil, cyberpunk corporation, full of important information and protected by "ICE" (a variety of William Gibson-esque firewall programs). On my opponent’s side, the cards are arranged to form his "rig" (computer) into programs, hardware, and resources. All the better to hack into my servers and steal my information. So far, he has managed to walk right past any protection I have placed on my servers, cutting through data barriers and stepping around AI sentries. But, right now, as I install my most expensive piece of ICE, I am confident. He has precious few funds left to his name, and I’ve managed to trash some of his most valuable programs. I know for a fact he can’t get through this server with his current rig. It’s his turn. First, he "installs" a program card that lets him, just once, look through his pile of unplayed cards and pull out any other program he chooses. He fingers through his cards and chooses a program I’ve never seen before. It apparently allows him to deactivate an "AP"-type ICE—exactly the kind of ICE protecting my server. He begins to hack, and he steps over my impenetrable firewall as easy as if he’s ordering a pizza online. He reaches across the table, steals the card I thought was so well protected, and wins the game. I have been absolutely destroyed. And I am utterly sincere. I am not at all angry about my defeat. It was a spectacular game. It always is in Netrunner. I rarely enjoy competitive games, digital or nondigital. I was never good at sports. Board games always seemed too dependent on luck. Growing up in the nineties,“multiplayer” video games were the ones my friends with Nintendo consoles owned, and we played them when they needed some rookie fodder to destroy in Mario Kart or Super Smash Brothers. With the exception of trying to beat a friend’s high score, playing a game to “master” it and “win” in order for someone else to “lose” has never really appealed to me. I grew up with single-player video games, the ones typically driven by a story, the ones where the player is always meant to win eventually. The computer is the antagonist, set up like a fiend from Power Rangers: impressive, but inevitably doomed to failure. The odds are always tipped in the player’s favor. Which makes my current fascination with the card game Netrunner quite surprising. Like many video game critics whose “play” is otherwise the domain of the digital, I have found myself buying booster packs of cards and organizing meet-ups to see my friends in "real" life just to play. It is a purely competitive card game full of jargon and complex rules. It’s up there with Magic: The Gathering or Warhammer 40,000 in terms of the number of obtuse rules you need to learn and the seriousness of the people who play it. It is, at first glance, precisely the kind of game I can’t tolerate. But since many of my friends were playing it, curiosity got the better of me.They were all saying these cool, cyberpunk-sounding sentences as they recalled different plays that I wanted to understand. “She ran on my R&D, but I rezzed an Ishi 2.0 and her rig only had a Crypsis with no viruses so she had to jack out.” What does that even mean? So I bought the beginner cards and played some messy games with my partner, stumbling through imperfect sessions with occasional glances at the rule book. The problem with nondigital games, you see, is there is no microprocessor referee keeping track of the rules for you, responding to each button press so quickly as to trick the mind into seeing real-time reactions. Every interaction has to be looked up in the index and understood before it can happen. Now, several months later, I am playing regularly with students and friends and friends-of-friends, meeting weekly in a local pub when before I could not even commit to playing a video game with someone on the same server. The reason I am enjoying it, I realized moments after my friend-of-a-friend opponent walked through my defenses and won the game, was simple: losing a game of Netrunner is no less enjoyable than winning a game. This isn’t a frustrated veiling of terrible skill with forced good sportspersonship. 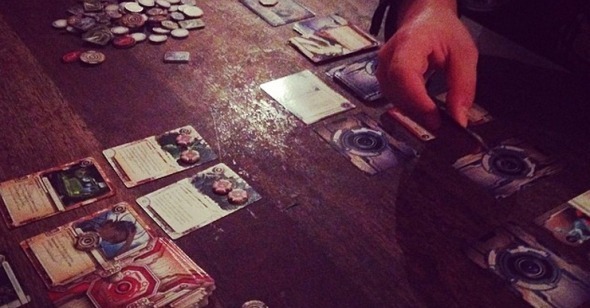 Losing Netrunner is no less enjoyable because winning Netrunner, at least for me, is not the point. Netrunner, is about forming that well-played game—the game that is pleasurable to be a part of because different objects and artifacts and rules and interactions couple together to create a particularly satisfying and spectacular performance. Like the ballet dance or theater production, the well-played game is something that is beautiful in its ephemerality. Those cool-sounding sentences my friends were saying were the resultant narratives of these well-played games. This is a column about video games for a website that will primarily discuss films, and I have spent a thousand words talking about a card game that is neither of these things. Yet Netrunner has helped me better appreciate the intimate bodily engagements one must make with the moving images on the screen in order to play a video game. A good Netrunner game (that is, any Netrunner game) ends with a satisfied look over the bench, at the cards that were in play, marveling at how this combination of cards created this outcome. As I have struggled to understand just how I can enjoy losing as much as I can enjoy winning, I’ve come to realize how much I enjoy being caught up in the spectacle of video games. I mean "caught up" quite literally—both partially responsible for and partially overwhelmed by the spectacle happening on the screen and in my lap. The system that uncoils when I play Netrunner requires a deep understanding of how the rules of each card works both independently and relatedly. The system that unfolds when I play most video games, on the other hand, doesn’t require an intellectual engagement so much as a bodily one: my deep understanding comes from how these sights and sounds respond to my fingers touching this or that button. Take, for instance, the various local multiplayer video games I’ve also fallen in love with this year. A variety of developers have turned their backs on online multiplayer to create games that recreate that competitive, shoulder-to-shoulder spectacle of multiple players crammed onto a single television screen, which most of us (with the exception of Nintendo) left behind in the 90s, seeing the single screen as an affordance, not a limitation. Messhof’s Nidhogg, Matt Thorson’s Towerfall, or the Sportsfriends bundle are well-designed, competitive video games. But more than this, they are spectacles that are fully aware that video games are watched as much as they are played—that watching is part of video game play. Another example is the game Flop (or what my friend and I deemed “Floppy Pong”), accessible through a cheat code on the Sportfriends home menu. Flop is Pong . . . kind of. The paddles are difficult to control, always springing back to the middle of the screen. They can also be rotated at various speeds. The ball, meanwhile, bounces and spins and obeys its own arcane physics. With a bit of practice, you can learn to hit the ball in such a way that puts some spin on it. The paddles are so hard to control that the slowest, simplest shot could crawl past you as you swing your paddle uselessly. Alternatively, hitting the ball just right on its corner sends it spiraling with an untraceable backspin. At the corners of the screen, ball and paddles alike twist and warp like the curve of an old cathode-ray-tube television. Flop is competitive but, more importantly, it is a spectacle, meant to be watched and played. Its unintuitive, slapstick design is meant to be laughed at by the player—winner and loser alike—no less than it is meant to be mastered and “won.” Just like the Netrunner cards scattered across the table, there’s a satisfaction, to how these sights and sounds combine with fingers and eyes to create particular performances. Really, on some level, this is how all video games function: these are not merely systems to be mastered, but images to be touched. The relationship between video games and film is one of love-hate in the various discourses around the two media—the creators of each often seem to both desire and reject the credibility of the other. Action films are becoming too video game-y and video games are too obsessed with being “cinematic.” The truth, as always, lies somewhere in the middle. A contention: saying that video games as a medium do not overlap with films is as absurd as saying they do not overlap with board games. They draw properties and engagements from each and mash them together. They take the systems and interlocking parts and the “play” required of nondigital games and mash them up with audiovisual pleasures of cinema and music. What’s of ultimate importance, then, is understanding the particular demands the moving images and sounds of the video game have on the player’s body. Video game players have to do something with their bodies if the video game is to advance. The film viewer is bodily involved in the film, to be sure, as Vivian Sobchack and other scholars have shown, but if they leave the room, the film keeps going. If the video game player puts down the controller or steps beyond the view of the motion sensor, the game will not progress. Mario will just go to sleep in the field. “The game” as a played, performed thing dissipates without the player. The player’s body is a fundamental component of the video game artifact. Video games are experienced through the body. A preconscious touching of moving images and sounds. An object in a movie looks fast. An object in a game feels fast. It’s why, just as Susan Sontag has written in the past about pornographic and science-fiction literature, video games sometimes struggle to be critically appreciated: they offer pleasures of the body before they offer pleasures of the mind. The main enjoyment of playing a video game comes from engaging with the video game: from doing something and that something feeling pleasurable to do. That will be the focus of this column: how we get caught up in these worlds and how they get caught up in us. It’s the satisfaction of understanding a system—made so clear to me by the pleasure of losing Netrunner spectacularly. But it’s also about sight and sound and touch. As players, we can stick our fingers—and our senses—right into the screen.